The family and I finally got around to trying Next Door, the other new Kimbal Musk restaurant. This one is in SoBro. 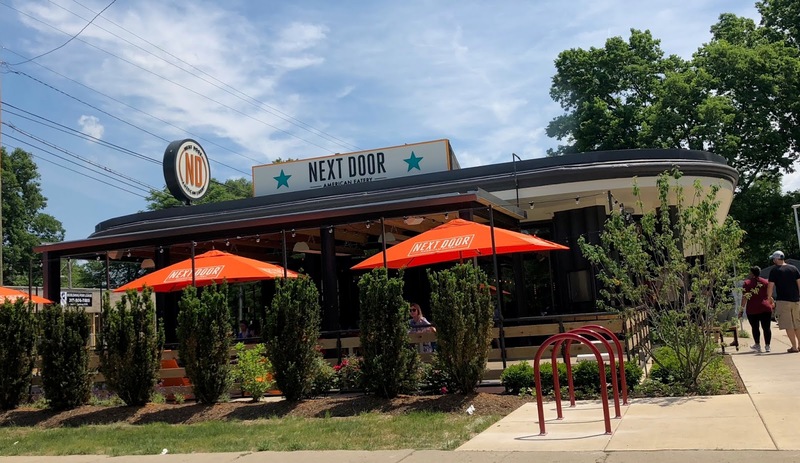 I have always thought this location just called out for a restaurant—it pretty much looked like an old diner, so I was glad to see something interesting go in here. We went for lunch (although I think their menu is the same at all meals). Wanting to try a lot of things, we ordered a couple of shareable items to start. 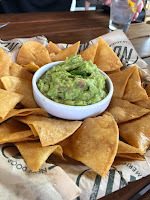 We had the chips and guacamole ($8.95) and the buffalo chicken bites ($10.95). 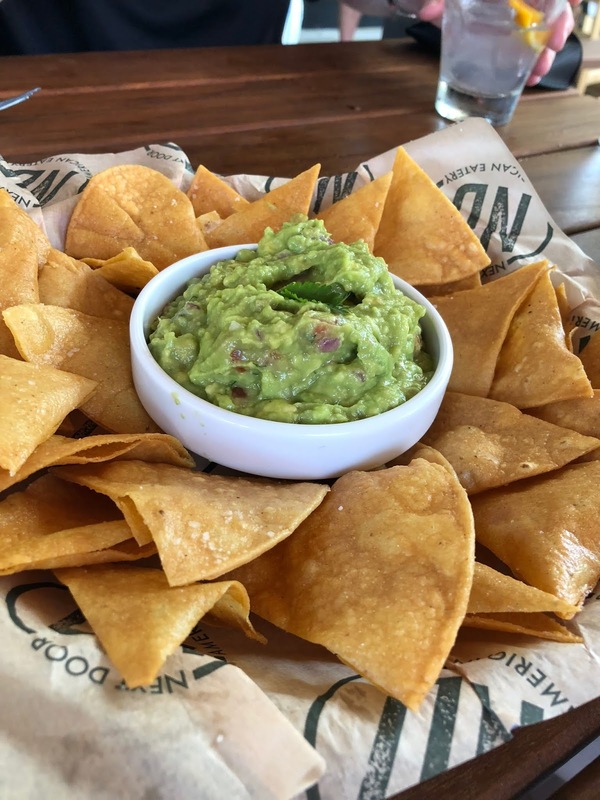 We were excited when we saw the chips—they sort of reminded us of the flour tortilla chips from Nada, which we all love. But these were not as tasty and needed salt. They were fine but not super exciting. Sadly, the same could be said of the guac. It definitely needed salt, and a little lime, and maybe some heat would have helped too. It was just kind of bland. The buffalo chicken bites were good. 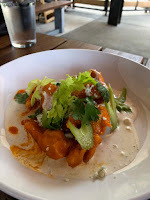 Nice slightly spicy flavor from the buffalo sauce that was tempered by the creamy dressing and chunks of blue cheese. I liked the flavor from some thin slices of celery and celery greens as well. I guess if I were going to improve the dish, the only thing I would suggest is that the pieces of chicken might be slightly bigger—they were a tad on the dry side. But ultimately, this ended up being my favorite dish on the table. 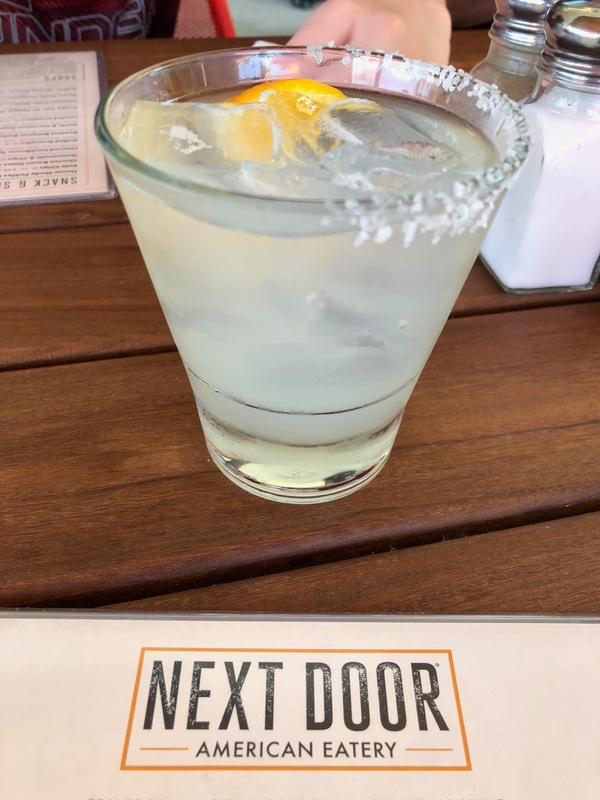 Hubby and I also had a house margarita ($7.50) and I have to say, it wasn’t very good—it was very light and had little flavor going on. 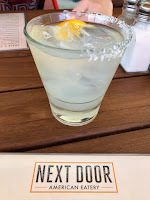 I rarely meet a margarita that I just don’t like, but this was one. For our main, hubby and I wanted to split a Cuban sandwich ($9.95) but were told only upon ordering it that they were out (hint, might want to tell people this at the very beginning of the service). We last minute changed to the “Merlin’s Carolina pork” sandwich ($11.95). 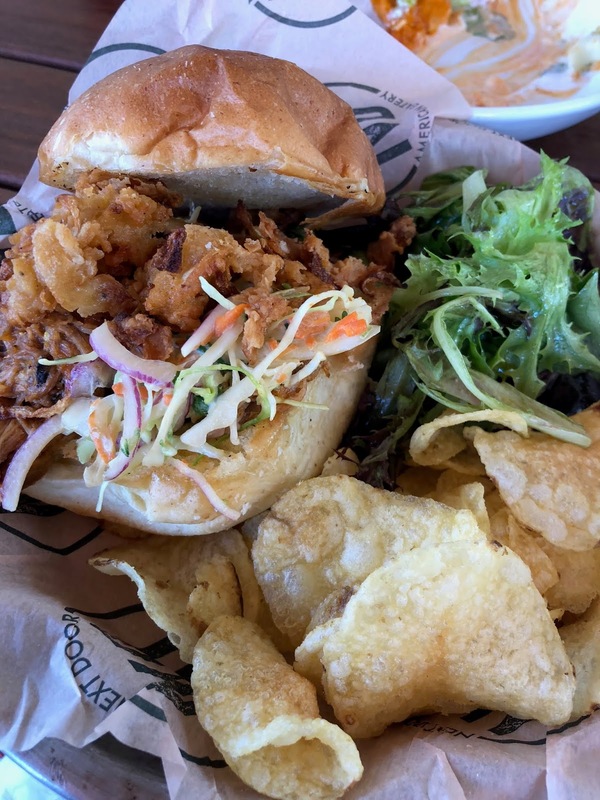 This sandwich has pork in mustard BBQ sauce, pickles, crispy onions, and cole slaw. So, this sandwich suffered from dryness too. You could barely tell there was sauce on the pork, and there seemed to be more crispy onions than there was pork. I liked the idea of fried onions on the sandwich, but in this case, they sort of just added to the dry factor. I asked for a side of sauce, which I eventually got, and this made the sandwich bearable, but still not particularly good. They serve the sandwiches with chips and dressed greens. Both were fine, but nothing that stood out. 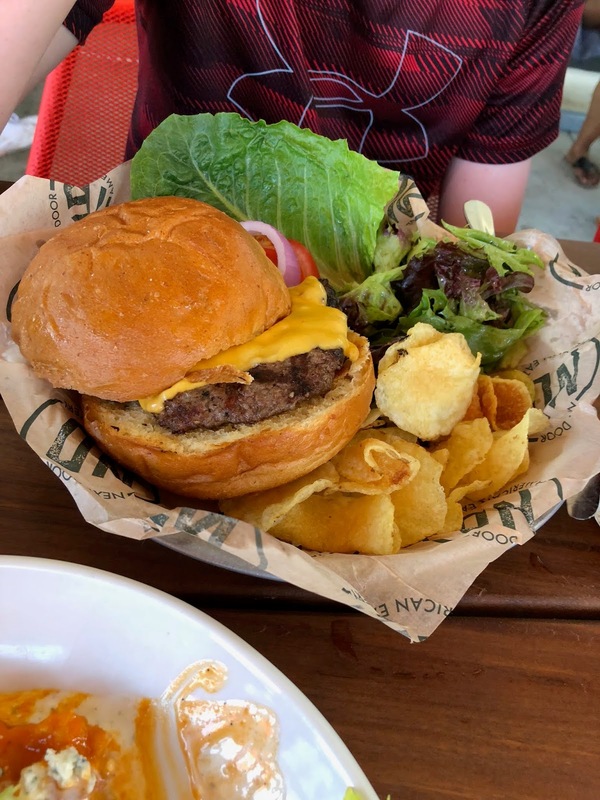 My son had the burger ($10.95). It comes topped with white cheddar and with the traditional garnishes on the side. They did not ask how he wanted it cooked, and it was cooked pretty well done. So guess what? Also, dry. Of the main dishes, it was probably the best one, but still not great. They really ought to cook it to order, or else cook it closer to medium. 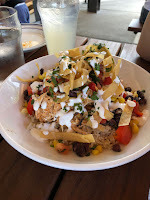 The worst of the entrées was my daughter’s ancho chile chicken bowl ($13.95). If I thought the other dishes came across as dry, this one took the cake. It was mainly rice topped with shredded chicken—both of these things pretty dry. 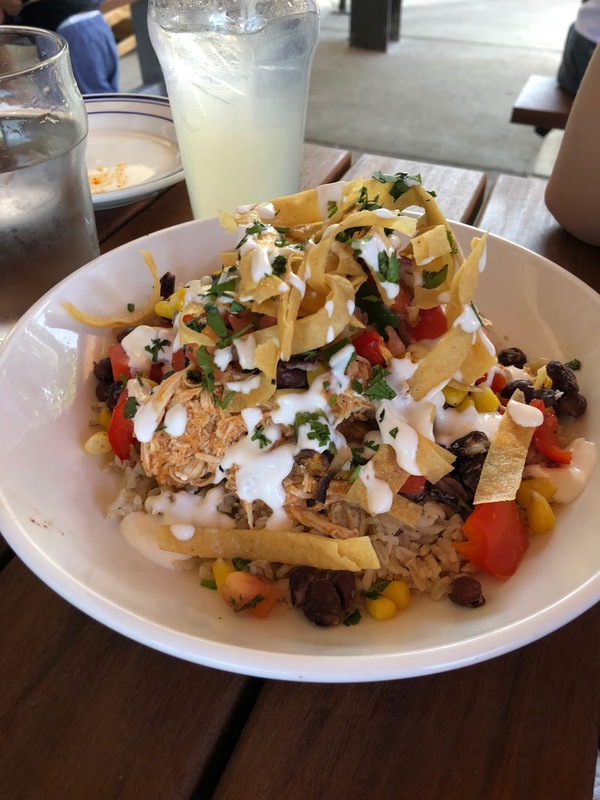 There were some tortilla strips on top, a bit of corn, beans, and peppers and then the whole thing was very lightly drizzled with lime crema. There was nowhere near enough of this crema to bring the moisture this dish needed. The few bites she ended up eating, she had with some of the leftover guacamole. The chicken wasn’t particularly flavorful either. This was definitely a pass. We thought we should try dessert just to give every course a chance. The only option was a gluten free chocolate chip cookie, so we went ahead and took a pass on this, considering we had homemade gluten-full chocolate chip cookies at home. Ok you guys, I wanted to like this place, and it’s really cute, but there was nothing that made me want to go back. Even the service was up and down. For instance, it took a solid 15-20 minutes to get our appetizers, but then we got our entrées within five minutes of getting the apps, even though we ordered them separately and later. It took awhile to get that side of sauce for our sandwich, and to get extra plates and things like this. We sat outside, which was lovely, but inside seemed pretty loud. The only thing I would consider ordering again were the buffalo chicken bites. So, if you have found something you love, please let me know. Otherwise, I am unlikely to return. Noise rating: 4 bells (out of 5) inside, quieter outside.